Welcome to our Talk About It Tuesday. Today, Jaimie is doing her third review for us for the book, 'Shiver'. This looks like a great one, and I wished I'd read it first, but after her review I will finish it. Enjoy her review and be sure to read the book. It's a good one! Forget about vampires and the typical take on werewolves. Shiver features an original spin on the beloved shape-shifters and a bonus likeable female lead. 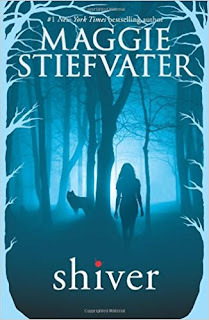 As someone who read a certain popular series about a love story between the mythical creatures mentioned and was frankly disappointed, I went into Shiver (which has some similar elements to the unnamed series) rather uncertain. The way I finished the novel? I was completely astonished, with tears in my eyes, feeling a desperate need to read the next book in the series. The award-winning author Maggie Stiefvater can easily turn simple words into something beautiful, which makes Shiver so memorable. The unique concepts about werewolves really made this novel stand out to me as well. In fact, I was so fond of Shiver, I finished the 390 page-turner all in one night. Grace’s stoic yet loving personality mends with Sam’s shy, poetic heart perfectly. Even the supporting characters and antagonists had an important part to play in the fantasy setting. I especially adored Sam’s lyrics and guitar playing, as a guitarist myself. I strongly recommend this novel to any young adult audiences, even if you aren’t a fan of the whole “mythical creature romance” craze. Stiefvater also has written several other novels targeted to the same type of audience, which I suggest checking out as I will myself. Until next time, when the next book in the Shiver series hopefully gets into my hands, thanks for reading.